In the summer of 2018, Fordham English graduate students Lina Jiang and Stephen Fragano, along with Associate Professor of English Julie Chun Kim, collaborated with Columbia faculty and graduate students on a project called Digital Grainger. 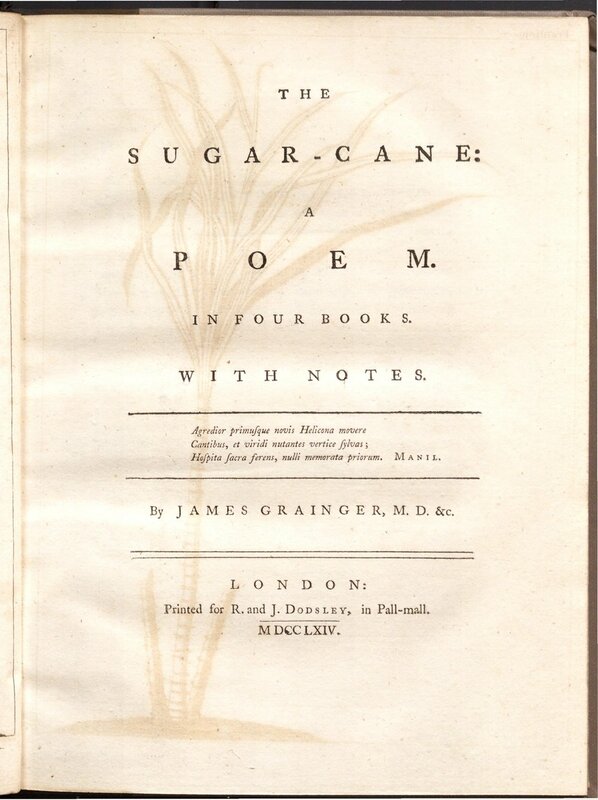 The Fordham-Columbia team’s goal was to build an online, accessible edition of James Grainger’s 1764 poem The Sugar-Cane. The collaboration between Fordham and Columbia Universities on Digital Grainger was made possible by the Fordham-Columbia Research Fellow and Research Intern Program. This initiative provides funding for faculty and graduate students to work together across campuses on a shared research project. For Digital Grainger, the program provided Lina and Stephen with summer stipends so that they could dedicate time to working on the project with other team members. The Columbia team included Cristobal Silva, Associate Professor of English and Comparative Literature; Kimberly Takahata and Ami Yoon, PhD candidates in English and Comparative Literature; and Alex Gil, Digital Scholarship Librarian at Columbia University Libraries. Elizabeth Cornell, Director of Communications for Fordham IT, also participated in the project. In addition to giving participants from both universities the opportunity to expand their scholarly networks, the Digital Grainger project has resulted in the creation of a digital edition of The Sugar-Cane that contains multiple versions of the poem. First, the team created a “Full Text” edition that contains all 2561 lines of the original poem along with Grainger’s footnotes. It is accompanied by over 700 editorial footnotes co-written by the Digital Grainger team. Second, the edition features a scanned a copy of the 1764 poem in its “Page by Page” version, allowing readers ready access to the original edition. Finally, each team member created what might be called a “thematic excerpt” of the poem: each excerpt contains a selection of passages from The Sugar-Cane, prefaced by a headnote that explains why they were chosen for inclusion. These excerpts, grouped under the heading “The Counter-Plantation,” are meant to help readers access the parts of the poem that describe survival, resistance, and rebellion on the plantation. Stephen focused his excerpt on “Animals,” which explores Grainger’s fearful troping of animals, including rats, as threats to the sugar cane crop. Lina focused her excerpts on the themes of “Fire” and “Sugar Work”: the former shows Grainger’s worries about enslaved laborers setting fire to cane fields, while the latter highlights both the mistreatment of enslaved workers and their extensive agricultural and technical knowledge of sugar refining (knowledge that planters relied upon). Lina first noticed these passages when she read The Sugar-Cane for Professor Kim’s fall 2017 graduate seminar, “Natural History and Ecology.” “I tried to provide deeper explanations for new readers of the poem,” Lina explains of her goal for the excerpts, “and ones that would help them challenge the poem’s support of the plantation system.” Digital Grainger demonstrates the English Department’s interest in continuing to pursue innovative scholarship: building on her experience with the project, Lina intends to include a digital project in her dissertation. Digital Grainger is almost complete and will go live later this semester. Meanwhile, scholarly collaboration between Fordham and Columbia continues to grow and develop. This semester, Lina is taking a course with Professor Silva at Columbia through the Inter-University Doctoral Consortium (IUDC), which allows PhD students at Fordham to take courses at Columbia, CUNY, NYU, Princeton, and Rutgers. Furthermore, members of the team will be presenting the results of their work at several conferences this coming year. In December 2018, Professor Kim will co-present a paper on the creation of Digital Grainger at the Caribbean Digital V conference at the University of the West Indies-St. Augustine. Together with Stephen, Professors Kim and Silva also have proposed a roundtable on using and teaching The Sugar-Canefor the February 2019 biennial meeting of the Society of Early Americanists. Just as their online edition of The Sugar-Cane will continue to inspire valuable new scholarship and rewarding experiences in classrooms, so the team’s work remains ongoing and productive, serving as a prime example of the kinds of exchanges that Fordham’s Graduate English students participate in on a regular basis. Click here for more information about Fordham’s Graduate English programs. 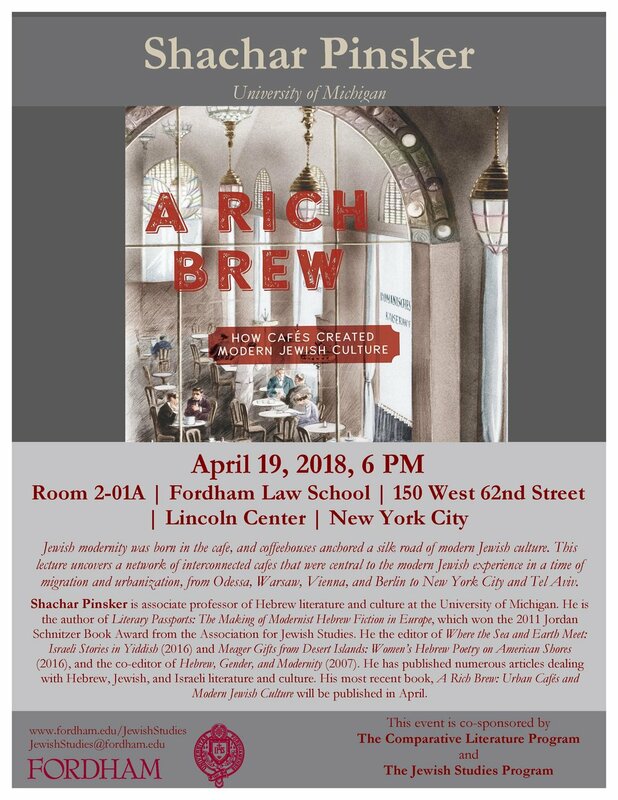 Shachar Pinsker (U. Michigan) presented a talk on the role of urban cafes in the development of modern Jewish culture on Thurs. April 19 at 6 pm in rm. 2-01A of the Law School. Histories of modern Jewish cultures face the challenge of how to fathom complex issues of place and space. Because Jews never conformed to the national concept of the unity of people, language and territory, modern Jewish culture developed within constantly shifting borders of empires and nation-states. Jews are a transnational people with multiple diasporas, and this project proposes to map the migration of multilingual literary and visual networks of cultures across the long 20th century. Using innovative digital tools and databases, we plan to visualize the tension between transnational and diasporic, but also grounded in a particular place; belonging to both global and local cultures. We hope to take macro and micro views of this network of people, analyzing both the diasporic and individual levels, as well as a multimedia view, such as visual and textual analogs. Digital humanities tools will allow us to map a non-linear, multimodal narrative. Pinsker's visit was co-sponsored by the programs in Jewish Studies and Comparative Literature. In the latest issue of Common-place: The Journal of Early American Life (17.4), Fordham English doctoral candidate Will Fenton discusses his digital humanities project, the Digital Paxton (digitalpaxton.org), a digital archive, scholarly edition, and teaching platform dedicated to Pennsylvania's first major pamphlet. Framing his project in terms of the print edition on which scholars have relied for almost 60 years (John Raine Dunbar's The Paxton Papers), Will discusses how the digital supports a more capacious--and less definitive--critical edition: "Tallying 400 pages, The Paxton Papers is already a formidable print edition, and one which continues to support research. But what else might we choose to include in twenty-first-century Paxton Papers? What if we weren’t bound, as Dunbar was, by the constraints of the codex format? The answer may not be a definitive edition for the Paxton event, so much as a tool with which contributors may magnify and telescope records, juxtapose them against one another, read them against contexts, and discover new ways of looking at—and beyond—the 1764 pamphlet war." Visit Common-place to read the piece, accompanied by various images from the Digital Paxton archive. PhD candidate Will Fenton this week published an article in Inside Higher Ed surveying the argument that humanities scholarship should embrace the practice of open peer review. Fenton quotes Cheryl Ball of West Virginia University, editor of Kairos: A Journal of Rhetoric, Technology, and Pedagogy, describing the humanities as "still stuck in that proprietary single-author non-collaborative model, where scholars are afraid to showcase their research before someone senior has put their stamp of approval on it through the traditional peer review process.” In contrast, Kairos and other journals such as Hybrid Pedagogy are experimenting with more collaborative, open models that may include, for instance, ongoing public revision of a submitted article, in which editors and readers suggest changes and additions to drafts after the piece is published in draft form online. It's a thought-provoking article--read it here. Participants at the Digital Pedagogy Lab summer institute. A Ph.D. candidate in English, Fenton worked over the past year to create the Digital Paxton project (digitalpaxton.org), a free resource featuring dozens of the pamphlets and cartoons, as well as accompanying essays and transcriptions. For him, the contemporary parallels are clear. "The term elite, weaponized in the 2016 election, figured heavily in the Paxton debate," said Fenton, while "many pamphleteers stoked debate anonymously, in much the same way that provocateurs hide behind Twitter handles." "In the context of the Brexit vote and the rise of right-wing nationalist movements across the West, [we] would do well to study this incident and to critically engage pamphleteers' zero-sum views of race, class, and cosmopolitanism," he said. Fenton’s project also recently won first prize in the NYCDH Graduate Student Digital Project Awards, for which he’ll be giving a talk at NYCDH Week. Fordham University's national literary magazine, CURA: A Literary Magaine of Art and Action is now accepting 2015 - 2016 submissions. Featuring creative writing, visual art, new media and video, our aim is to seem to integrate literary art publishing with social justice. CURA contributors have won Rockefeller, Guggenheim, American Book, and National Endowment for the Arts awards. Past issues have featured work by Alice Fulton, Brenda Hillman, Evie Shockley and Patricia Smith and Rigoberto Gonzalez. In 2015 - 2016 our magazine is dedicated to Black Lives Matter. We are resolved to gather voice, art and action toward the struggle for racial justice. Accordingly, work submitted for consideration should be in some way related to this theme. We seek to promote a movement of creative response guided by meaningful action -- to celebrate active citizenship where a republic of writers, filmmakers, visual and digital artists converge. What Martín Espada has written about the social responsibility of the "Republic of Poetry" we believe applies to a Republic of all the Arts. It is "a place where creativity meets community, where the imagination serves humanity. [It] is a republic of justice because the practice of justice is the highest form of human expression." Christy Pottroff, a Ph.D. Candidate in English, has been awarded the NYCDH Graduate Student Digital Project Award for her digital mapping project, The U.S. Goes Postal: Mapping Union and War in the Antebellum Era. The NYC Digital Humanities Group awards three prizes to graduate students from the New York City area who are pursuing DH projects. Pottroff’s digital map tracks the growth of post offices and postal routes in the United States from 1790 to 1865 using the platform Neatline. Postal growth during this period is remarkable: in 1790 there were 75 post offices in the country; by 1865 there were 28,882. Pottroff’s project offers an important perspective on the postal system’s relationship to colonization in the early national period. Her datasets show the postal service to be a tool of colonization: post offices and routes crept into territory outside of the United States, making it easier for states like Maine, Florida, and Missouri to be integrated into the national body. In mapping the uneven and contentious national border, her project will eventually show how frontier post offices were fundamental to the project of manifest destiny. Pottroff’s digital project benefits from the postal service’s unflagging dedication to paperwork. The National Archives alone houses 662 boxes of postal route ledgers for each mail route in the country. What had been a staggering amount of bureaucratic minutiae is now—thanks to the sophistication of digital mapping programs—raw data for a dynamic project that will be accessible to a broad audience. Pottroff encourages graduate students and faculty to engage with the generous and dynamic community of digital humanities scholars in New York City. Pottroff writes “I have been able to acquire the necessary technical skills for this project thanks to workshops and resources at Fordham. Elizabeth Cornell (English PhD; Fordham IT) and others have offered guidance and support throughout the past year.” Clearly, there is a thriving community of digital humanities scholars at Fordham and in NYC.